Out of hospital cardiac arrest (OHCA) is encountered on a regular basis in prehospital care. Specific guidelines exist for cardiopulmonary resuscitation. Guidelines cover most related situations but cannot cover all of them. This article reports on a 71-year-old man who suffered an OHCA. Persisting gasping and recurrent ventricular fibrillation made the prehospital management difficult and imposed challenges on the whole team. The guidelines provided no answers to this specific situation. Wittingly, the emergency physician decided to abandon the standard approach. Based on this case, this article discusses the pathophysiological considerations and an approach deviating from the standard approach, which could have led to a positive patient outcome without casting doubt on the current resuscitation guidelines. 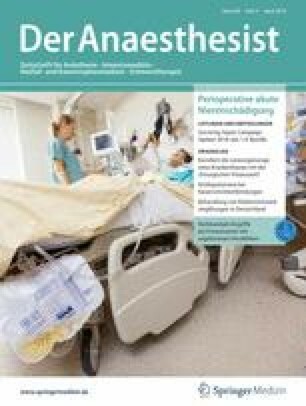 Die kardiopulmonale Reanimation gehört zu den regelmäßig auftretenden prähospitalen Notfällen, für die durch die Reanimationsleitlinien ein Standardvorgehen abgebildet ist. Diese adressieren auch die meisten Reanimationsumstände, können aber nicht allumfassend sein. In diesem Beitrag wird über den Fall eines 71-jährigen Mannes mit prähospitalem Kreislaufstillstand („out-of-hospital cardiac arrest“, [OHCA]) berichtet. Persistierende Schnappatmung und rekurrierendes Kammerflimmern gestalten die Prähospitalversorgung komplex und fordern das gesamte Team. Bisweilen treten Situationen auf, für die die Leitlinien keine Lösung anbieten. Der Notarzt entscheidet sich bei ausbleibendem Reanimationserfolg bewusst, von den Leitlinien abzuweichen. Anhand dieses Falles werden pathophysiologische Überlegungen und ein abweichendes Vorgehen vom Standardvorgehen diskutiert, was zu einem positiven Ergebnis beigetragen haben könnte. Die gültigen Reanimationsleitlinien sollen jedoch hierdurch nicht in Frage gestellt werden. M.-M. Ventzke and G.I. Kemming declare that they have no competing interests. This article does not contain any studies with human participants or animals performed by any of the authors. For images or other information within the manuscript which could identify the patient, consent was obtained from the patient or the legal guardian.